It’s been less than a day since we got our last update from NASA’s Insight lander and it’s sent a revelatory new message home: the sounds of Mars. InSight successfully landed on the Martian surface on November 26, and has blessed us with several high-resolution views of its desolate surroundings. Now, for the first time in history, it’s sent back the ghostly sound of the Martian winds. In a recent video by NASA’s Jet Propulsion Laboratory, we get to hear sounds and vibrations from the Red Planet. The recordings come courtesy of InSight’s seismometer and air pressure sensor. At the time of the recording, the air pressure sensor recorded a wind of 10-15 mph (15-24 km/h). The seismometer will eventually be used — once InSight finds a spot for it on the surface of Mars — to listen to the planet’s “pulse,” meaning the seismic vibrations that could give scientists precious clues into what’s going on inside Mars. The air pressure sensor will help the seismometer make sense of those measurements. The recording themselves were taking on December 1, according to the video’s caption. JPL had to pitch and speed up parts of the recording so that they could be heard on laptop and smartphone speakers. 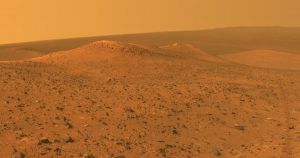 Its a fascinating glimpse into what it’s like to be on the surface of Mars. We still have to wait a couple of months until scientists will get the instruments’ first readings, but until then, let’s enjoy listening to the eerie sounds of a planet that’s millions of miles away.